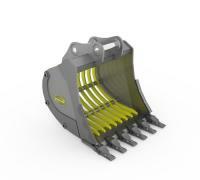 Shaker Buckets help sort materials on site, reducing transport costs and increasing productivity. Built to the same profile and strength as our HD Buckets. 400BHN edge, side wear plates and side wear shrouds. Three, heavy-walled tube cross members tie the entire skeleton together, which dramatically increases the rigidity of the bucket over conventional designs.